The Cub Trail can be downloaded from the SCOUTS South Africa website: Cub Trail. When you join the Cub Pack, you must first complete all the requirements for the Cub Membership badge. Then you can be invested, which means you can wear the Cub uniform and scarf and the special badge which Cubs, Scouts and leaders all over the world wear on their left pocket. Once you are invested as a Cub, you will work towards your Silver Wolf badge. Along the way to the Silver Wolf you will earn four challenge awards: the Awareness Challenge (Green Paw), Community Challenge (Yellow Paw), Outdoor Challenge (Blue Paw), and Aptitude Challenge (Red Paw), and you will earn a badge for each of these. Completing the Silver Wolf should take about 2 years. After your Silver Wolf, you will work towards your Gold Wolf badge. Again, you will earn four challenge badges along the way: Awareness Challenge (Caracal), Community Challenge (Cheetah), Outdoor Challenge (Leopard) and Aptitude Challenge (Lion). 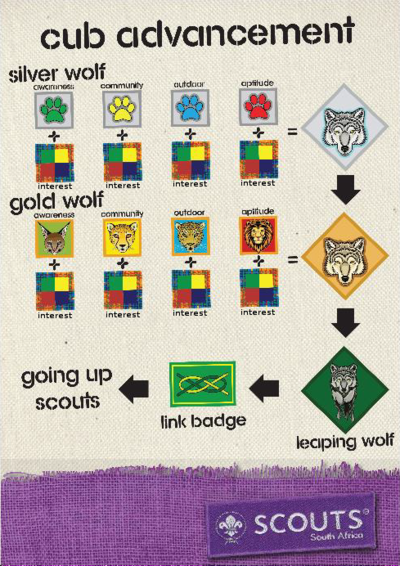 Once you are 10, you are in your final year at Cubs, and you can work towards your Leaping Wolf badge, which is the highest award a Cub can earn. Finally, before you turn 11 and go to the Scout Troop, you will meet the Troop Scouter and the Scouts, and work on your Link Badge. This tells others that you have been a Cub and are now going up to the Scout Troop where you will continue your journey as a Scout. While you are a Cub you can also earn Cub Interest Badges, and there are many to choose from, according to your own interests. Please note that content, PDF files, images, or other items on this page are copyrighted, and may not be reproduced without permission.